Squirrel - SUNDANCE RANCH CO.
Squirrel, a filly by Hollywoodstinseltown and out of Shiny Hot Pants (x Shining Spark), is a standout weanling in Clinton’s herd of performance horses. She’s well-balanced with the temperament to excel on a world stage. Clinton is excited about her future as a reining prospect and is looking for a passionate horseman to partner with him as he trains and eventually competes with Squirrel at NRHA events. Squirrel is by 2009 NRHA Open Derby Reserve Champion, Hollywoodstinseltown, was a force to be reckoned with in the show pen, winning $185,886, and now he’s passing on his supreme athletic ability and great mind to his foals. In the three years that his foals have been competing, their earnings have topped $365,980, and they can be found competing in all of the major futurities and derbies. 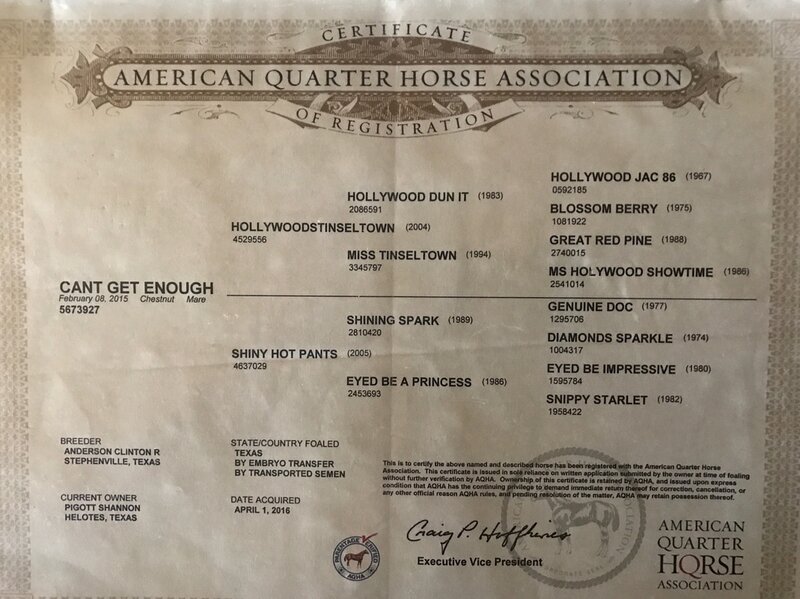 The young stallion is by NRHA 6 Million Dollar Sire and hall of famer, Hollywood Dun It, and out of one of the greatest NRHA show mares of all-time, Miss Tinseltown. Squirrel’s dam, Shiny Hot Pants, won $3,836 during her short show career and is a full sister to Princess In Diamonds, producer of three NRHA Open Futurity Finalists and AQHA World Champions and the 2009 Equi-Stat Leading Reining Dam with lifetime earnings of $77,002. Princess In Diamonds’ offspring have earned $684,122.